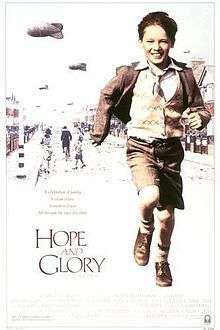 Hope and Glory is a 1987 British comedy-drama-war film, written, produced and directed by John Boorman and based on his own experiences of growing up in the Blitz in London during the Second World War. The title is derived from the traditional British patriotic song "Land of Hope and Glory". The film was distributed by Columbia Pictures. Beginning just before the start of the Second World War, the film tells the story of the Rohan family: Bill, his sisters Sue and Dawn, and his parents Grace and Clive, living in a suburb of London. After the war starts, Clive joins the army, leaving Grace alone to watch over the children. Seen through the eyes of 10-year-old Bill, the "fireworks" provided by the Blitz every night are as exciting as they are terrifying. His family do not see things in quite the same way as the bombs continue to drop, but their will to survive brings them closer together. The nightly raids do not provide the only drama, however, as his older sister, Dawn, falls for a Canadian soldier, becomes pregnant and, finding her life turned upside down, soon discovers the value of her family. The family eventually moves to the Thames-side home of Grace's parents when their house burns down (not in an air raid, but in an ordinary fire). This provides an opportunity for Bill to spend more time with his curmudgeonly grandfather. The main film set was built on the disused runway at the former Wisley Airfield in Surrey and other scenes by the river were shot near Shepperton Lock. The film received Academy Awards nominations for Best Art Direction-Set Decoration (Anthony D.G. Pratt, Joanne Woollard), Best Cinematography, Best Director, Best Picture and Best Writing, Screenplay Written Directly for the Screen. The film was nominated for the prestigious Grand Prix of the Belgian Film Critics Association. The "newsreel" footage shown in the local cinema contains scenes from the 1969 film Battle of Britain. The film was favourably reviewed by critic Pauline Kael in her film reviews collection Hooked. It's hard to believe that a great comedy could be made of the Blitz but John Boorman has done it. In his new, autobiographical film, he has had the inspiration to desentimentalize wartime Britain and show us the Second World War the way he saw it as an eight-year-old. The war frees the Rohans from the dismal monotony of their pinched white-collar lives. He doesn't deny the war its terrors. Yet he gives everything a comic fillip. That's the joy of the film: the war has its horrors, but it also destroys much of what the genteel poor like Grace Rohan (Sarah Miles), have barely been able to acknowledge they wanted destroyed. It's like a plainspoken, English variant of the Taviani brothers' The Night of the Shooting Stars. A sequel to the film, titled Queen and Country, was made in 2014. The film tells the story of an older Bill Rohan as a soldier during the Korean War. The film was selected to be screened as part of the Directors' Fortnight section of the 2014 Cannes Film Festival. It was released generally in 2015. ↑ Janet Maslin (9 October 1987). "Film Festival; Boorman's Hope and Glory". The New York Times. Retrieved 24 September 2008. ↑ Richard Corliss (19 October 1987). "War Dreams: Hope and Glory". Time. Retrieved 24 September 2008. ↑ Ebert, Roger (6 November 1987). "Hope and Glory". Chicago Sun-Times. This situation leads to one of the film's best scenes, when the daughter confesses her love for a Canadian soldier – and reveals that she is pregnant. ↑ "The 60th Academy Awards (1988) Nominees and Winners". oscars.org. Retrieved 31 July 2011. ↑ Kael, Pauline. Hooked. pp. 367–369. ISBN 0-7145-2903-6. ↑ Justin Kroll (11 September 2012). "John Boorman sets 'Hope and Glory' sequel". Variety. Retrieved 28 October 2012. ↑ "Cannes Directors' Fortnight 2014 lineup unveiled". Screendaily. Retrieved 26 April 2014.